If your fireplace looks outdated or doesn’t quite match the room, you’ll probably want to paint the surrounding brick a color that blends in with the walls. Choose a shade that either matches the walls or comes very close to matching them. Make sure that the shade is similar to the trim as well to make it virtually disappear. You can also paint the mantel to match the walls and ceiling for more blending. Alternatively, painting the fireplace a color that contrasts with the walls can make it pop. Be sure to take the surrounding furniture into consideration as well when choosing your color. 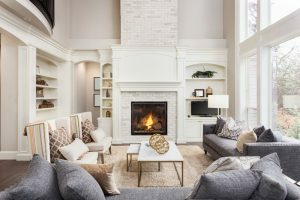 For a mostly white wall, painting the fireplace charcoal helps create a focal point in the room, but you can just as easily use brown or gray as well. You can also paint the mantel black and the brick around the fireplace white to create varying levels of color. Unlike walls or ceilings, brick is much more porous and therefore requires different preparation steps to paint properly. Start by examining your brick closely, checking for large cracks in the mortar. If you notice large deposits of salt, also known as efflorescence, you’ll need to remove it first. This also goes for any dirt or other debris. Use a stiff-bristled brush and hot soapy water to wash the brick. If this isn’t enough to remove dirt or salt deposits, you can also mix half a cup of trisodium phosphate and a gallon of water to make a stronger cleaning mixture. Never use acidic cleaning agents to clean brick as it can cause the paint to chip. Also, make sure the brick is completely dry before applying any paint. Drying will take at least 24 hours. Once the area is dry and you’ve filled any cracks with acrylic caulk, place tape around the surrounding wall and place a drop cloth to protect your floor. Then, apply a layer of latex or latex-acrylic primer to the brick. Each layer of primer requires extensive drying before you apply another layer. Use a semi- or high-gloss finish to highlight the brick’s texture as well. Want a professional’s advice and help for painting your dated fireplace? Schedule a consultation with a Plano painting company to learn more! The team at Platinum Painting only focuses on the interior and exterior of residential homes. Not only will you get a great result after your paint job, but valuable advice on making your home look beautiful to guests and your family. To get a free quote for your next home designing project, contact the Idea Guys through their website.